0.7.5 is the old version for 4.6.2. I’ll have to try that on a fresh installation of the newest 4.7 final but I wasn’t aware of that. Notice "Undefined index: $(".custom-")" in /home/kliklak/public_html/infra/textpattern/lib/txplib_misc.php(1826) : eval()'d code at line 459.
preexisting settings for my write tabs are only half existing and appear somehow garbled. EDIT: Tried several times now, the error reappears after disabling/reenabling plugin. here, in the multiple select tool, the section dropdown show the sections hidden in the bot_wtc window. Is it possible to hide the same sections as in the write screen, and display here the titles and not the names ? And sort the titles ! Here, in the multiple select tool, the section dropdown show the sections hidden in the bot_wtc window. Is it possible to hide the same sections as in the write screen, and display here the titles and not the names ? And sort the titles ! As far as I can tell, the section dropdown is constructed here using this function which requires key => value array pairs (see notes above the function) to construct the dropdown with labels. Currently that’s populated by $all_sections which is a single list array of just the section names. Retrieve the section titles into a second array, e.g. $all_section_titles, using the same sort order as $all_sections, then array_combine the two into a new name => Label array (or start over and create a fresh array out of the ‘name’ and ‘title’ of txp_section). Look up the hidden sections in the table txp_prefs called bot_wtc_static_sections and unset those sections from the array. Sort the array by the title. Replace the inputSelect line using your own new array. The remainder should still function, all you’ve changed is the construction of the dropdown. Hiding sections as in bot_wtc is not as important as posting titles rather than names, for our clients. On the write tab, there is a pluggable_ui hook for replacing the entire section dropdown. I think that’s what Gocom used (also for his status radio buttons plugin). But you’re talking about the article list page, or am I mistaken? It’s possible that some of the code for the section dropdown on the write tab could be relevant for the multi-edit chooser, but the ui element for the multi_edit chooser is more complex as it covers lots of situations in one combo box. 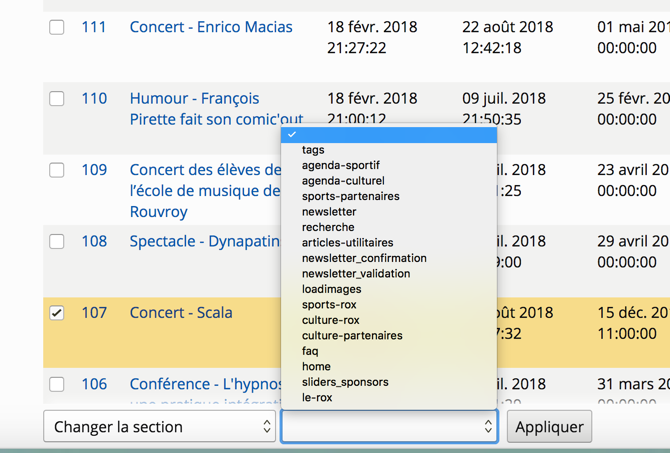 However, I want to reveal this inconsistency, when we compare the two drop down here: the categories listed and sorted by title, and the sections listed by name, and not sorted … What disturb the user. You’re right, it should really be the section titles in alphabetical order. The same goes for the authors too. As far as I can tell, categories and statuses (stati?) are already okay. I’ve added an issue to GitHub for that. Then you’d only need to do the removing items from the list with js.